Gingivitis is the first stage of gum disease. 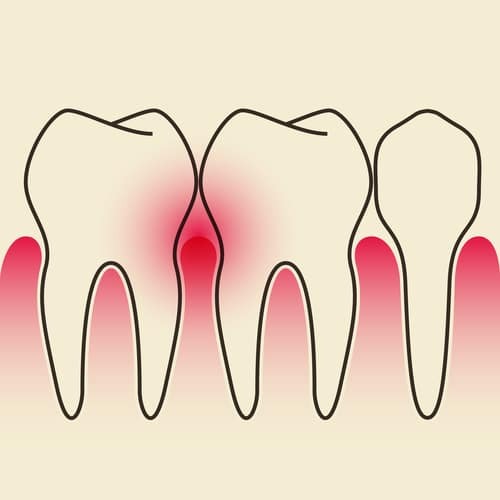 It occurs when there is inflammation of the gums; the gums become red, swollen and bleed easily. However, this form of gum disease does not include any loss of bone or tissue that hold your teeth in place. The longer that you allow plaque and tartar to build up on and around your teeth, the more harmful these bacteria become, causing gingivitis. Other factors can cause gingivitis, including hormones (which flare up during pregnancy, puberty, and menopause), a severe lack of vitamin B and or C, certain medications, tooth demineralisation, and diseases that affect the body’s immune system can also be involved. The good new is that Gingivitis is a common, preventable dental disease that affects many people. It can usually be reversed with daily brushing and flossing, and regular cleaning by a dentist or dental hygienist, such as the expert team at dhealth Dentistry. To begin, our team of friendly dental care experts will thoroughly examine your gums and teeth. During our exam, we will inspect all of your gum tissue and will probably even measure the depths of your gum pockets, particularly the area closest to your teeth. We do this by using a very small probe. Depending on the severity of your Gingivitis, we may also decide to take x-rays of your entire mouth, just so that we can determine whether any bone loss has occurred, and if so, the type and severity. Depending on what our examination reveals, we will then give you a thorough diagnosis and design a tailored plan to treat and get rid of any gingivitis. This treatment plan will usually begin with a thorough scale and clean. This process will remove all the plaque and calculus deposits around your teeth and gums, giving your gums a chance to heal. We may need to perform this clean and scale over the course of two visits. We will then run through your home dental care routine, including daily brushing and flossing, and perhaps even the use of an antiseptic mouthwash for a short period of time. Your daily dental care routine is paramount in ensuring that your gums respond well after a scale and clean. Regular professional dental cleans and good home care is essential to maintaining the health of the gums. If gingivitis is left untreated, in severe case, it can progress to periodontitis and even result in the loss of teeth. Treating gingivitis early is the best way to prevent missing teeth. Often times, a range of side effects that make everyday activities quite painful accompanies gingivitis. These side effects include tender gums and puffy gums. Treating your gingivitis should eradicate these painful side effects. Halitosis (also known as bad breath) is a very common side effect of gingivitis. If you take the time to treat the cause of your bad breathe, you’ll soon find that it disappears altogether. Gingivitis can be accompanied by bleeding gums. Treating your gingivitis will put a stop to this embarrassing side effect. In the process, this will improve not only your smile, but your self-confidence as well.